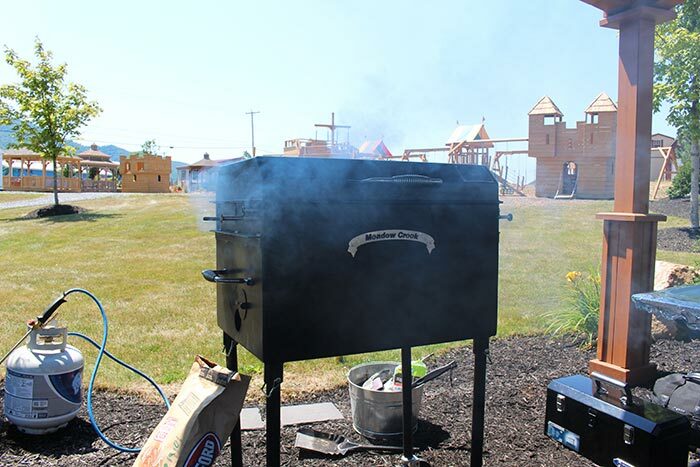 This month, I had the privilege of grilling at Shawnee Structures for their Open House. In one day we grilled 120 pounds of chicken legs and thighs on my (tiny) BBQ26S Chicken Cooker and 50 burgers on a second charcoal grill. The Open House was on Friday and Saturday, but I was only available to cook on Friday, so they asked me to grill chicken for Saturday too. 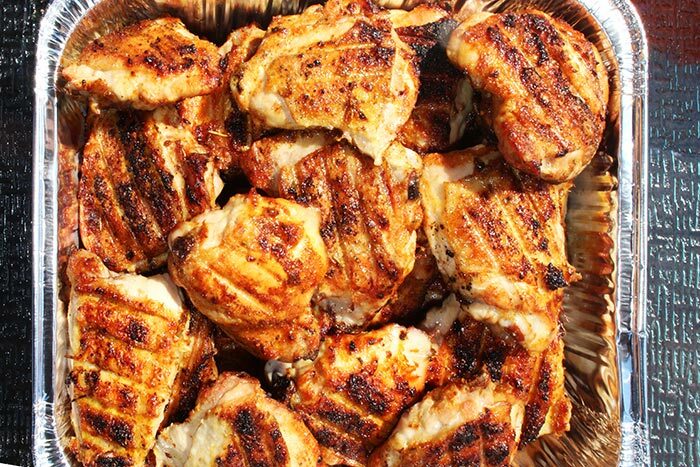 I had planned to cook only 90 pounds but since the chicken comes in 40 pound cases, I had gotten 120 pounds. The customer asked if I’d grill the extra meat for them, so I stayed a couple hours longer to grill the rest of it. 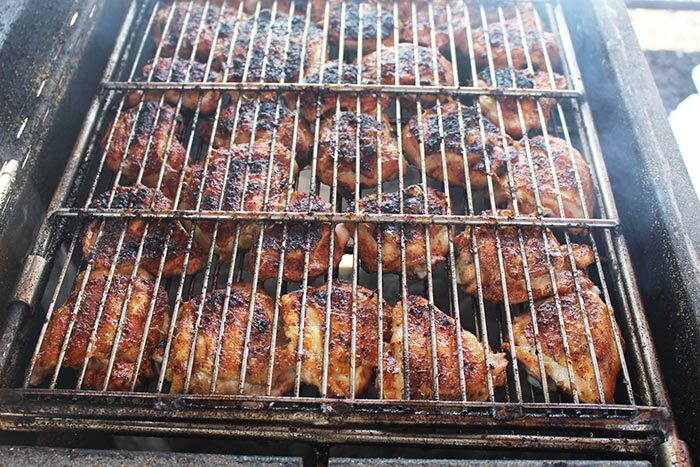 The BBQ26S holds around 15 pounds of chicken, so it took 8 batches to crank through 120 pounds of meat. 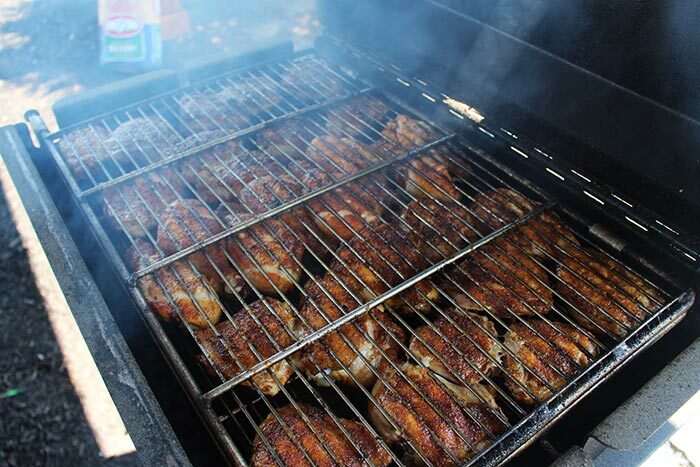 I arrived on-site around 10:30 am, got the grill hot soon after 11:00, and the first batch of chicken done by 12:10. Batch 8 went on the grill at 7:15 and finished sometime after 8:00 pm. 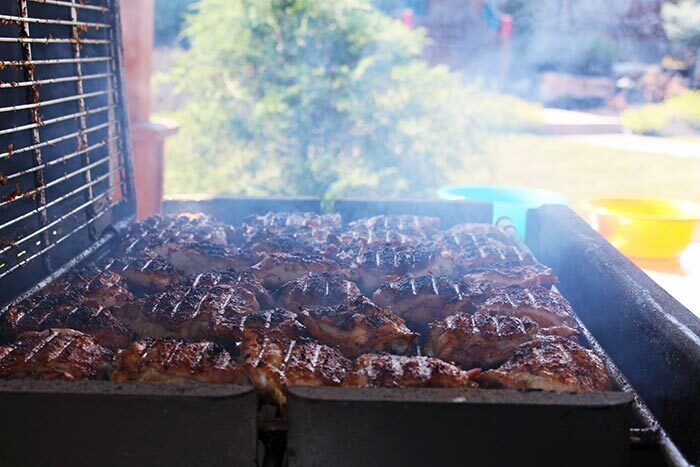 I certainly got my daily fill of smoke and sizzle that day! 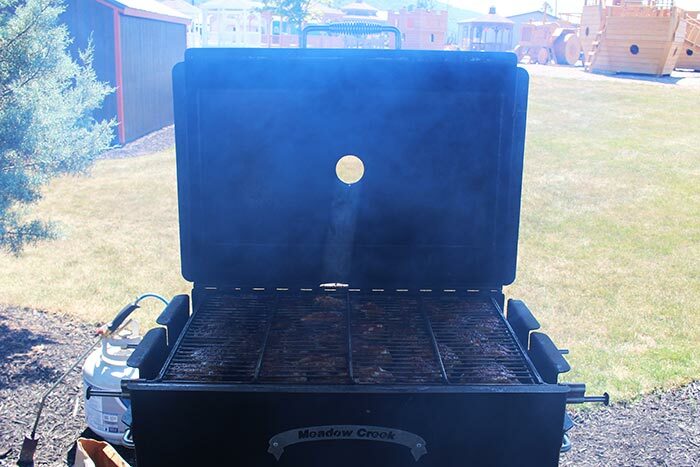 You may be wondering why I’d fool around with a small backyard grill, being a blogger for Meadow Creek equipment and all. That’s a great question. For one thing, I am no longer in the same community as our warehouse, and I’ve never meant to pursue cooking for crowds. However, people keep asking me to cook for their events, and since I enjoy it so much, I’ll probably get myself a bigger smoker and grill within the next year or so. Loaded and ready to hit the road! 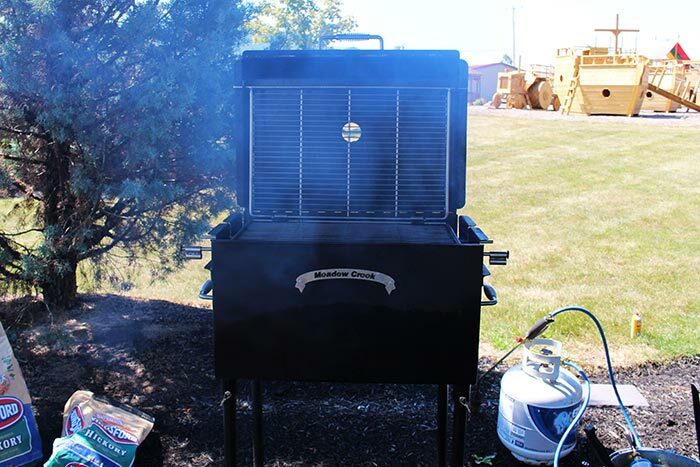 Click here for prices and more info on the BBQ26S Grill. If I have a good hot fire in the grill, I can crank through a batch in 45 minutes. If the fire is not very hot, it will take over an hour. 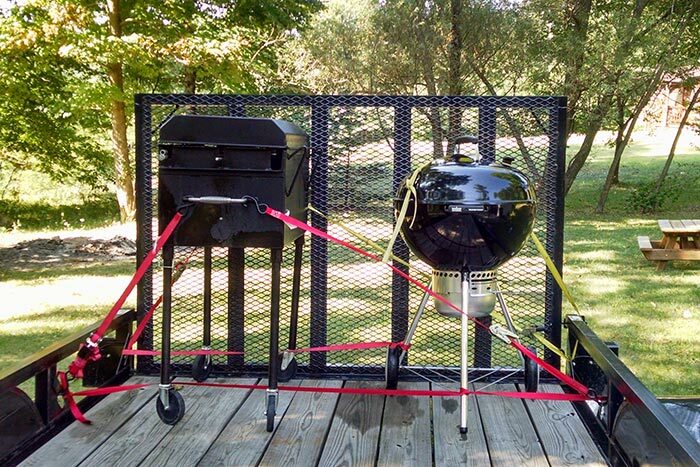 I used Kingsford charcoal briquettes from our local True Value Hardware; they come in 14+ pound bags. 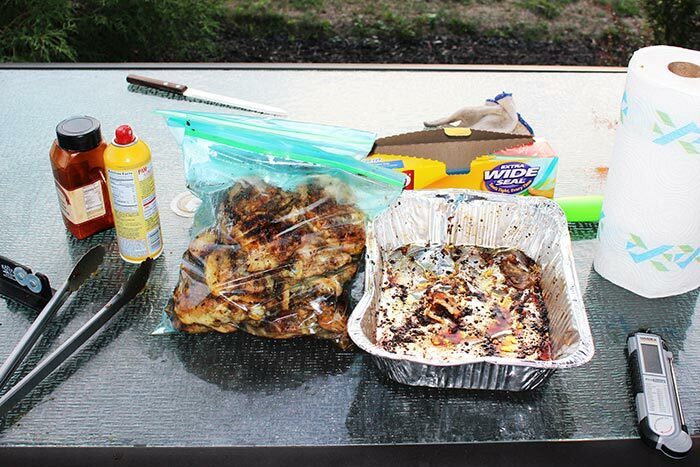 I fired the grill with one bag, which covers the entire charcoal pan; one bag lasted for the first two batches. For the best performing fire, I would recommend using the charcoal for no more than 2, maybe 3 batches, and then cleaning it out completely and starting over. However, I couldn’t wait for a whole new batch of coals to light every couple hours, and I didn’t want to waste all that partially burned charcoal, so I just took some ashes out the best I could with my little coal shovel and stirred the coals as needed between some of the batches. After the second batch, I added roughly half a bag of charcoal to the existing bed of coals. After the fourth batch, I added the rest of the charcoal from the second bag. By now, there were a lot of ashes in the pan, but I stoked the coals with a shovel to give them more oxygen, and batch 5 got done in good time. I had to clean out some of the ashes once or twice that day so that the charcoal would burn properly, and I can’t remember exactly when I did that. I used another bag and a half to finish the last batches. 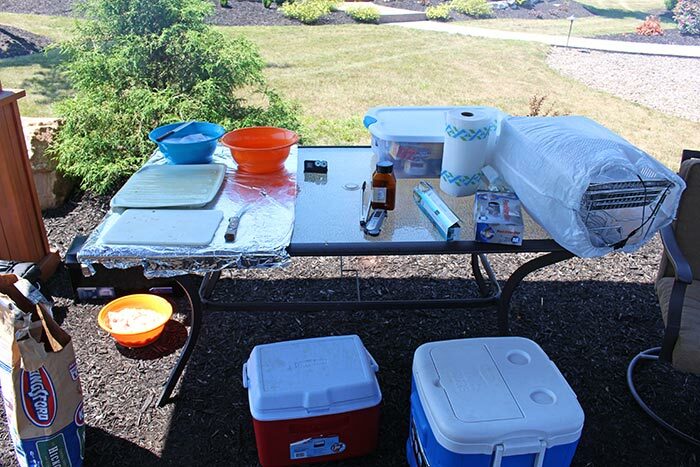 In all, I used 3.5 bags or 50 pounds of charcoal for the 120 pounds of chicken. 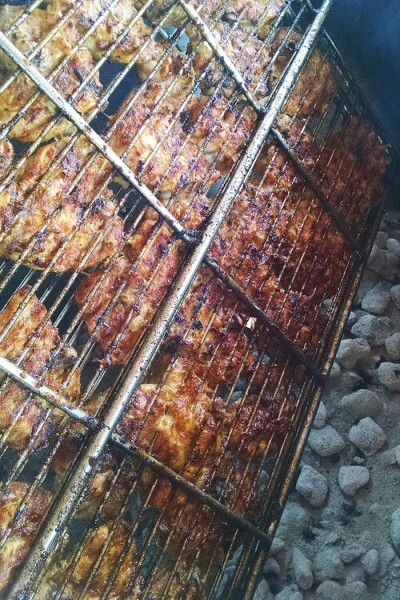 We put some of the chicken directly into a chest to keep it hot for serving Friday. The rest we put in aluminum pans to cool for a bit, then into gallon Ziploc bags for cooling and reheating the next day. On Saturday, they reheated the chicken as needed in an electric roaster. 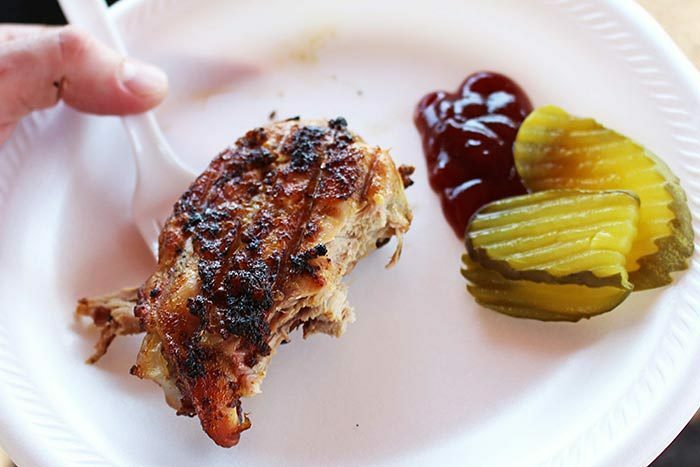 Meadow Creek makes the BBQ42, which holds about 40 pounds of chicken, and even larger models with multiple pits on a trailer. Where these grills really shine is mounted onto a TS120 or TS250 tank smoker trailer for grilling while you’re cooking low and slow! The chicken was just great. The crowd was a bit smaller on Saturday so we did not go through as much chicken. We had lots of chicken left over for employees. Thanks for the great work. I had to trim it up a bit, but then I put it directly on the grill and seasoned it with Meadow Creek Gourmet Seasoning once it was on the grill. Great looking cook Lavern. What did you use for seasoning? 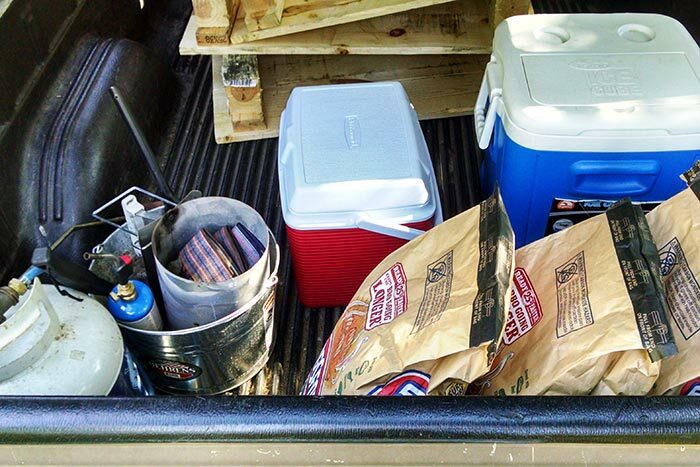 I have to agree with your statement that a BBQ42 and a TS120 SHINE together…because mine certainly does. 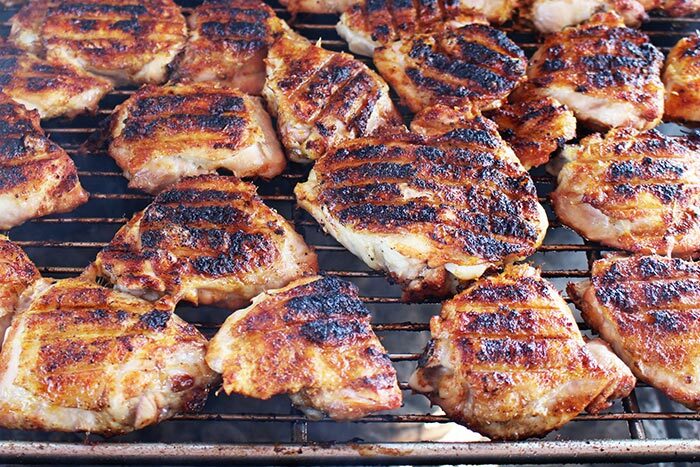 I used Meadow Creek Gourmet Seasoning on all the chicken. Delicious stuff!